1. Craig TJ, et al. Efficacy of human C1 esterase inhibitor concentrate compared with placebo in acute hereditary angioedema attacks. J Allergy Clin Immunol. 2009;124(4): 801-808. 2. Hassen GW, et al. Fresh frozen plasma for progressive and refractory angiotensin-converting enzyme inhibitor-induced angioedema. J Emerg Med. 2013;44(4):764-772. 3. Ishoo E, et al. Predicting airway risk in angioedema: staging system based on presentation. Otolaryngology-Head and Neck Surg. 1999;121(3): 263-268. 4. Moellman JJ, Bernstein JA, Lindsell C. A Consensus Parameter for the Evaluation and Management of Angioedema in the Emergency Department. Academic Emerg Med. 2014;21(4): 469-484. This phase II/III randomized, double-blind, placebo controlled study included 125 patients with hereditary angioedema that were treated in a 3-arm study of C1 esterase inhibitor (CI-INH) (Berinert). Patients with a known history of hereditary angioedema (HAE) who presented to one of 36 participating sites with either a facial or gastrointestinal attack were enrolled. They were randomized to either placebo, low-dose (10units/kg) C1-INH, or high-dose (20units/kg) CI-INH. The primary endpoint of time to symptom relief was evaluated using an intention to treat analysis. Patients in the high-dose arm had significantly faster resolution of their symptoms (0.5 hrs vs 1.5 hrs) compared to placebo. Patients in the low-dose arm did not have a significant difference in time to symptom resolution (1.2 hrs vs 1.5 hrs) when compared to placebo. Additionally, the authors looked at patients who seems to have progression of their symptoms after initial treatment and were eligible for either a blinded rescue medication (additional dose if in the low dose arm, placebo if in the high dose arm) or fresh frozen plasma (FFP). 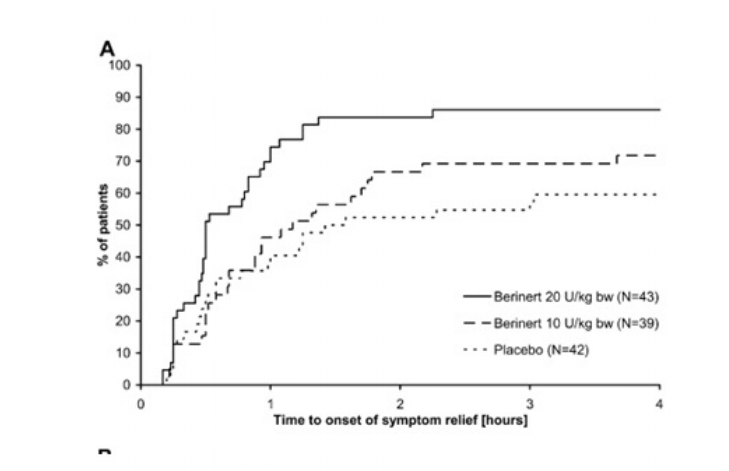 This study showed a dramatically faster time to symptom relief in the high-dose arm, as well as many patients in the placebo or low-dose arm requiring rescue medications due to progression of symptoms. There were no significant complications or side effects from this high dose regimen. Bottomline: Overall, this study showed the utility and dose efficacy of a rarely used medication for these otherwise difficult to treat patients. In a single site case series of 7 patients with refractory ACE-inhibitor induced angioedema, the use of FFP was described. 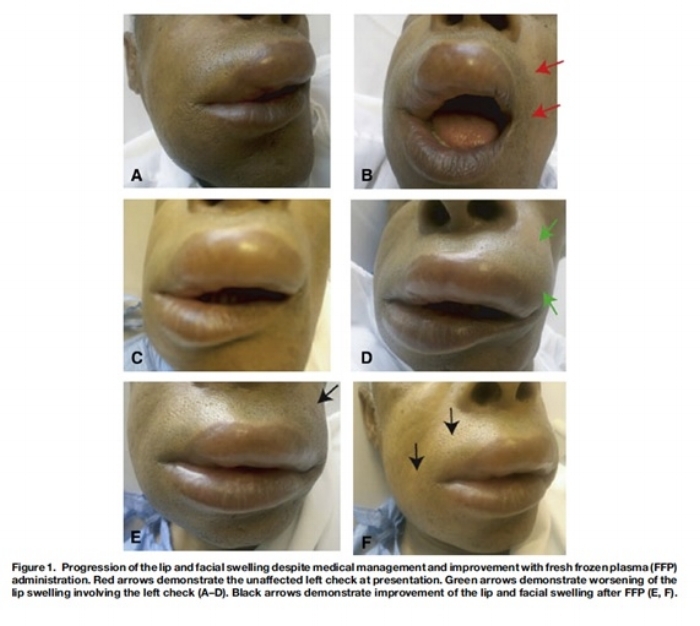 Based on the use of FFP in HAE, its use has spread to other bradykinin mediated angioedema cases. The rationale described is that Kinase II (present in FFP) is identical to ACE and it catalyzes the degradation of excessive bradykin. In this series of 7 patients, the authors looked at ACE-induced angioedema that did not respond to antihistamine therapies. These patients received between 1 and 3 units of FFP usually several hours into their evaluation as the symptoms were noted to be progressing. The authors report a plateau in symptoms in 5 patients, improvement in 1 patient, and “avoided intubation” in 1 patient. All patients were admitted to the ICU. The authors report a temporal relationship between administration in FFP and clinical improvement. Bottomline: This study explores the same type of treatment pathway in the Craig et al. study, but uses FFP instead of C1-INH. This is an important option as FFP is readily available at most institutions and much less expensive than the C1-INH. The authors noted a preponderance of Stage 1 and Stage 2 patients were able to be treated on an outpatient basis or admitted to a general medicine ward. Most Stage 3 and Stage 4 patients were admitted to the ICU, with 24% of the Stage 4 patients requiring airway intervention. Bottomline: While this study was not studying a specific etiology of angioedema or treatment regimen, it describes an extensive experience with signs and symptoms that the ED provider can use to risk stratify patients. Angioedema is a low-frequency, high-risk patient presentation that requires great attention from the ED provider. Fortunately, most cases are histamine mediated and can be readily treated with anaphylaxis treatment regimens that are readily available. Since bradykinin mediated angioedema does not traditionally respond to anaphylaxis treatment, we explored this subset of patients in our articles. We paid special attention to the two most common treatments in the literature: FFP and C1-esterase inhibitors. Craig, et al demonstrated a very rapid improvement in symptoms of patients with hereditary angioedema when treated with C1-INH. While the cost of this medication remains very high and it is not readily available at all departments, this clear dose-dependent response suggests that at least for HAE it should be the mainstay of therapy. In a separate bradykinin-mediated cohort (ACE induced angioedema), Hassen et al. looked at the use of the readily available and cost effective treatment with FFP. These cases mostly showed a plateau of symptoms after an average of 2 units of FFP administration. Of note, this article demonstrated a timeline of several hours for symptom plateau or resolution in most patients, which may not be appropriate for a patient with critical airway edema. Literature not reviewed here has started looking at the utility of C1-INH agents in these ACE induced cases. Some benefit has been noted and may be most appropriate in a patient with critical airway edema. Unfortunately, cost and availability of these agents may be limiting for some practice environments. Ishoo et al reviewed their experience with a large case series of all-cause angioedema, specifically shedding light on the stability of Stage 1 and Stage 2 anatomy. Our journal club discussion stressed the importance of bedside fiberoptic nasopharyngoscopy (to evaluate for laryngeal involvement) in those patients with hoarseness or stridor. All in all, the group felt strongly that C1-INH have become the mainstay of therapy for our HAE patients and likely for our ACE-induced patients as well. If an C1-INH is not immediately available, FFP seems like a reasonable alternative with the success demonstrated above. After reviewing these articles and an in-depth discussion of the airway considerations for angioedema patients, our group is ready to spend some significant time practicing with our flexible NP scope.